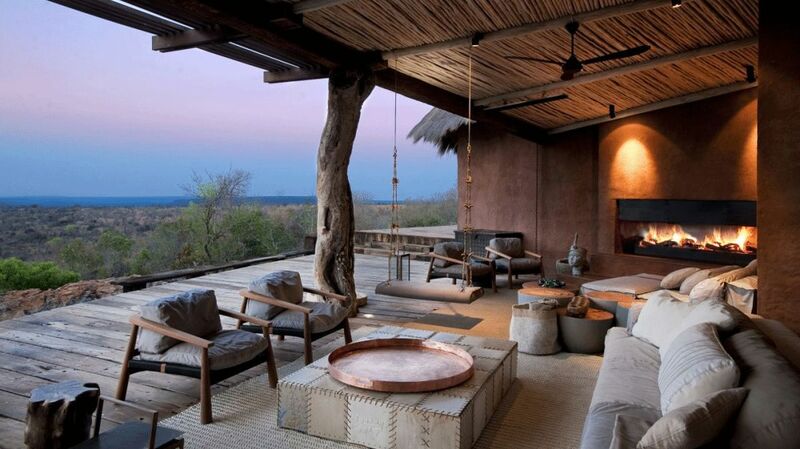 Gone are the days of “roughing it” in the bush in meager tented camps. Safari expeditions have evolved and so have the accompanying accommodations. Now you can enjoy the spoils of modern luxury in exclusive Safari Lodges, while relishing in a once-in-a-lifetime experience. These luxe accommodations make the perfect destination for a family adventure or romantic couples retreat. Below we’ve rounded up 10 of the best luxury safari lodges, ranging from tented camps with an opulent twist to unique private estates, all offering thrilling experiences to commune with some of the world’s most magnificent creatures. Located along the banks of the Zambezi river and just a 45-minute drive from the rumbles of the majestic Victoria Falls, the Matetsi Victoria Falls provides a luxury oasis for guests to experience a world-class Zambia safari right outside their doorsteps. 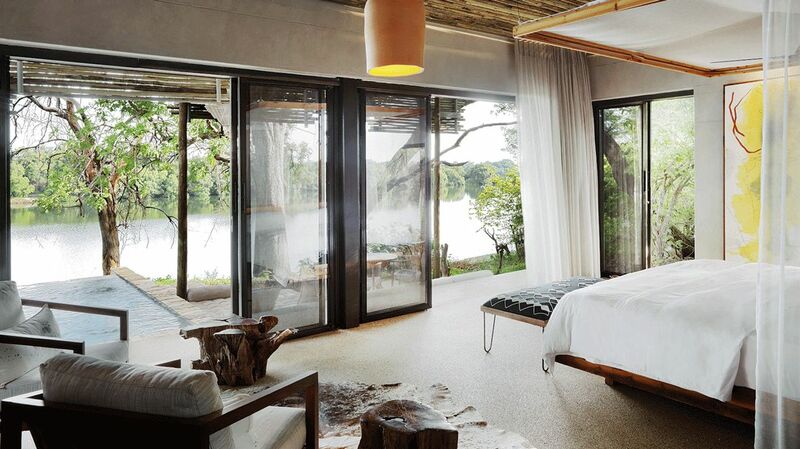 The lodge features 18 riverfront-facing suites that are divided into two camps; in addition to the Matetsi River House, an exclusive private 4-bedroom villa, perfect for larger families. Explore the 55,000 hectares of private game reserve and discover lush landscapes, come face-to-face with African wildlife and immerse yourself in rich Zimbabwean culture. Guests can delight in game drives and walking safaris that will lead to the ultimate up-close encounter with animals such as elephants, buffalos, hippos, giraffes, lions and hyenas, while more than 366 species of birds can be spotted. For those who crave a little bit more daring adventure, take on the roaring waves of the Zambezi on a white-water rafting excursion, or bungee jump from the Victoria Falls Bridge. Get a front row seat to the Kruger National Park where this legend-worthy, exclusive concession is one of the best safari regions in Southern Africa. Located in a game-rich area, guests will enjoy sightings of the “Big Five” as well as an incredible diversity of other wildlife. This luxurious safari lodge is perched amongst giant Euphorbia trees in the Lebombo Mountains giving guests breathtaking views of the African bush below. Garnering inspiration from the surrounding nature, the newly renovated villas and suites of the Singita Lebombo Lodge are constructed almost entirely of glass and combine bold and contemporary design with natural elements, fully embracing its philosophy of “touching the earth lightly”. Indulge in a sumptuous spa treatment, take a refreshing dip in the 25-meter lap pool or create other exceptional memories with activities such as private moonlit bush dinners and stargazing trips. Imagine floating blissfully over the Maasai Mara, as the sun rises from its slumber and African wildlife traverses the vast plains below. Enjoy this iconic experience during your stay at the Angama Mara, a remarkable safari lodge in Kenya, nestled neatly between ‘heaven and earth’. Home of the Mara Triangle and Great Migration, the Angama Mara Lodge overlooks what is arguably one of the most incredible game reserves on the continent, and one of the best safari locations in the world. Inspired by the Swahili word for “suspended in mid-air”, guests can relax and unwind in stylish tented suites with unprecedented views and unmatched privacy. From walking safaris to hot air balloon rides and riveting traditional dances by Maasai Warriors, your days can be as leisurely or adventure-filled as you please at the Angama Mara. For the hopeless romantics, you can even reenact the scenes of the great love story “Out of Africa” with a romantic picnic on the crest of the hill where many of the scenes from this iconic movie were shot. Adventure begins as soon as you arrive at the Sabi Sands game reserve. 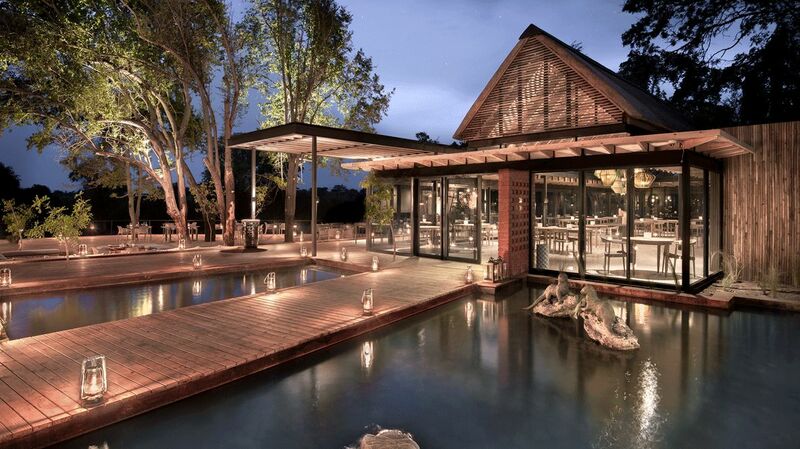 This generational family-owned game reserve is situated adjacent to the coveted Kruger National Park, where wildlife is free to move between the properties as there is no fence to separate them, making this luxury Africa lodge stand out from the rest. Located on the banks of the Sand River and in the heart of South Africa’s safari country, the Singita Ebony Lodge features twelve ornately decorated family-friendly suites, with their own private plunge pool, perfect for game viewing. Day visitors are not allowed; therefore, you will have exclusive access to an unforgettable wildlife experience. The Sabi Sands is renowned for its frequent leopard sightings and up-close and personal encounters with Africa’s top predators, such as cheetah, lion, and wild dogs. Experienced safari guides and rangers are even allowed to drive off road to follow wildlife wherever they go, so fire up your cameras because this is one Instagram-worthy shot you won’t want to miss! 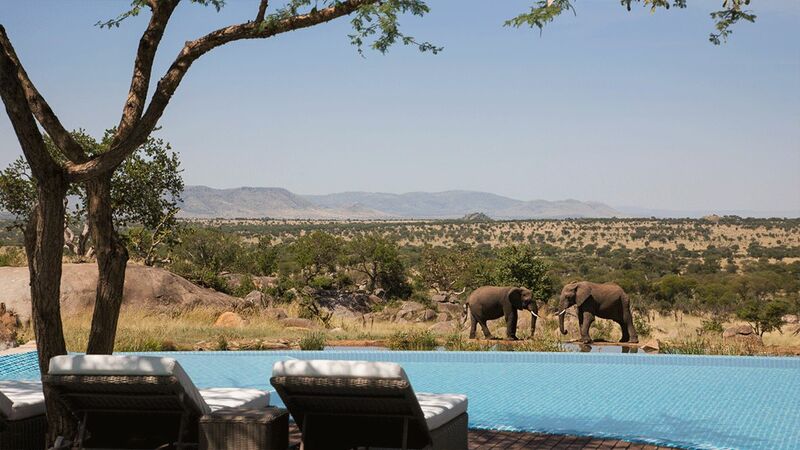 What better way to start your morning than lounging on your private deck, admiring a herd of elephants, nature’s gentle giants, gather around the active waterhole just beyond your private, infinity-edge plunge pool? We cannot think of any. Can you? 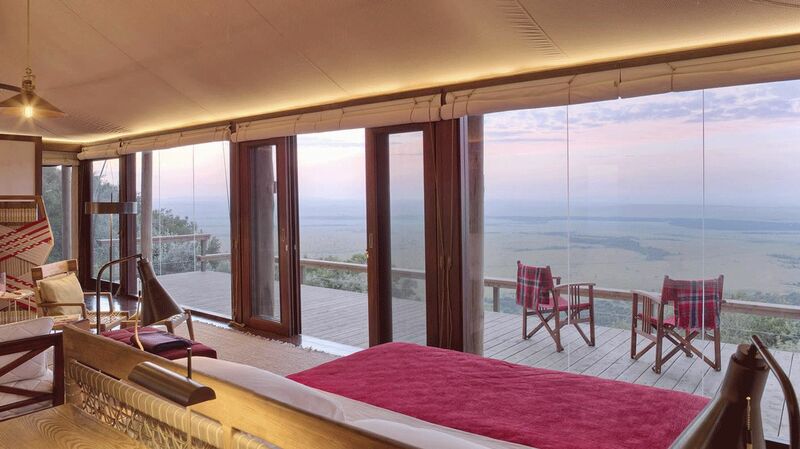 At the Four Seasons Safari Lodge Serengeti you will experience just that. This 77-room luxurious lodge is situated in the heart of Tanzania’s most famous safari locale, the Serengeti National Park. Brave the wild with an adventurous game drive or embark on an exciting armchair safari. 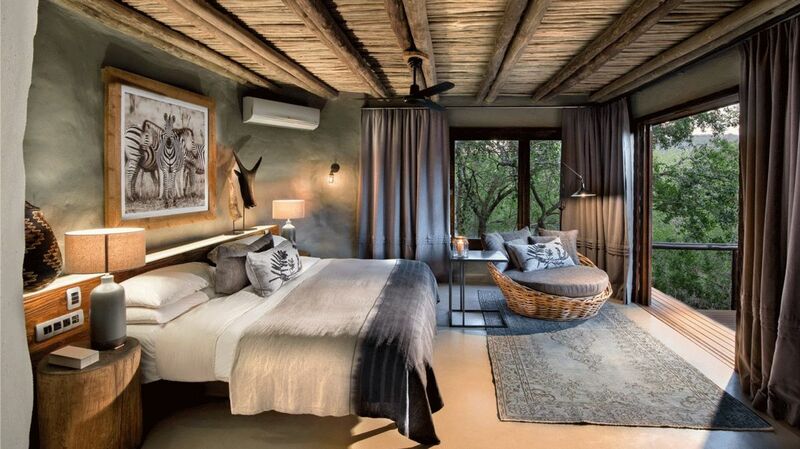 This unique safari lodge ensures you never miss a sighting with their built-in cameras that allow you to watch animals gather at the nearby waterhole or grazing waterbucks in the bushveld from your room. Want a different perspective? Take an early morning flight and get a bird’s eye view of the best that Tanzania has to offer. The “Big Five” is virtually synonymous with African safaris. You almost cannot mention one without the other, as the two in tandem offer travelers an incredible once-in-a-lifetime experience. However, the malaria-free Madikwe Game Reserve takes it up a notch and introduces you to the Super Seven, the Big Five plus cheetah and wild dog. Situated on the border of Botswana, the Molori Safari is an ultra luxe lodge giving you access to one of Africa’s best safari destinations. 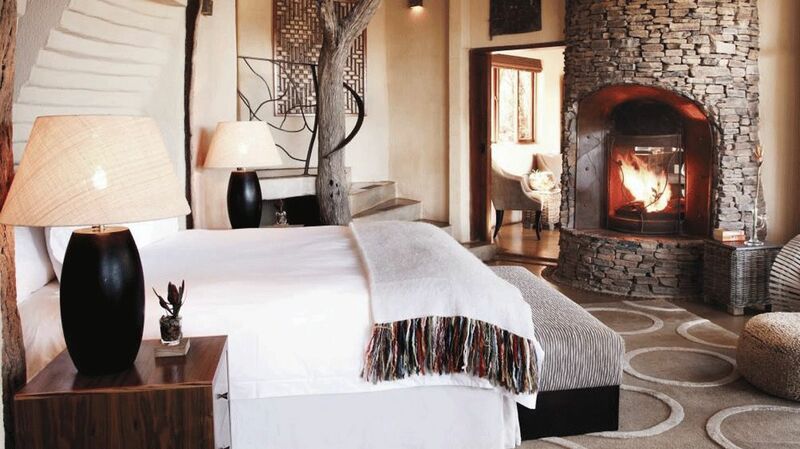 As one of the most exclusive lodges in the Madikwe Game Reserve, the Molori Safari boasts just five illustrious suites, featuring floor-to-ceiling retractable glass walls that open up to a private deck and infinity pool; as well as indoor/outdoor showers and al fresco dining overlooking the reserve. The Leobo Private Reserve is for guests who are truly looking for an exclusive safari escape with no boundaries and no limits. It is one of the few sole-use private reserves in South Africa, granting guests full access to the entire estate. Nestled within an 8,000 hectare private estate in the malaria-free and diverse Waterberg region, the Leobo offers unparalleled panoramic views of the lush Palala Valley from open-air verandas. Whether you opt for The Observatory, the main house that accommodates nine in the three-suite retreat, or The Lodge that sleeps 18 in eight independent chalets, your every whim will be catered to by a private chef, butler and maid services. The Leobo Private Reserve was created to offer a more personalized and less commercial experience. Besides the common game drives, there are endless opportunities of fun on reserve. Strike out on your own via horseback or quad bike, in search of giraffes, wildebeest, hippos and other wildlife found in the reserve. Perhaps clay-pigeon shooting or rock climbing is more your speed. Either way, you have the unparalleled freedom to do as much or as little as you please. 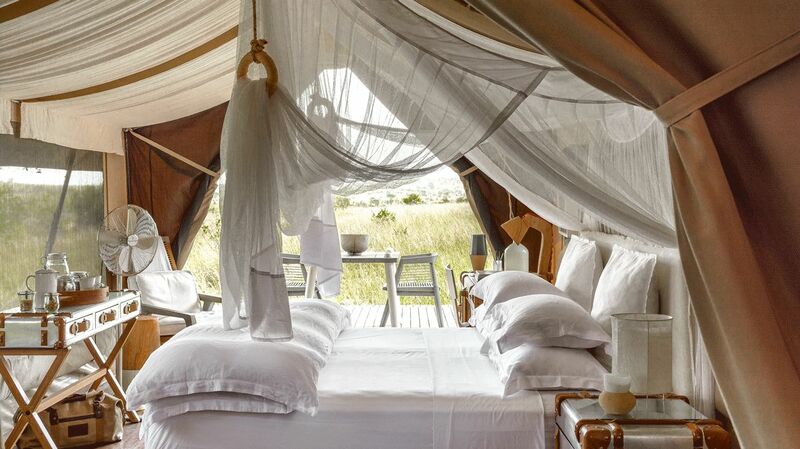 The Singita Sabora Camp takes glamping to a whole new level. With nine lavish 1920s inspired tents resting along the Great Migration Route, your stay here will be one nostalgic adventure out on the Serengeti plains. 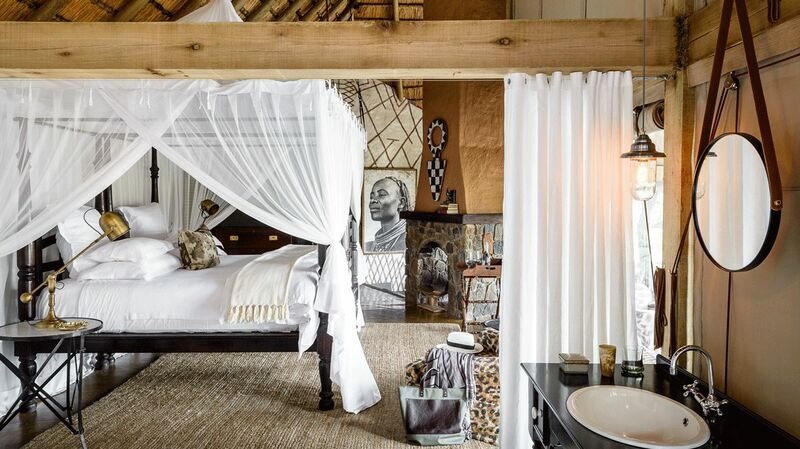 Though these luxury safari tents will take you a step back in time, you won’t have to miss modern comforts such as air conditioning, an outdoor shower, and an en suite bathroom. Discover the magic of the Grumeti Reserve, spanning over 350,000 acres in Northern Tanzania and enjoy a refreshing cocktail on your veranda as wildlife strolls casually through the camp, giving you an up-close experience you will cherish a lifetime. If you plan your trip just right, you will even bear witness to the famous wildebeest and zebra migration on your Tanzania safari. 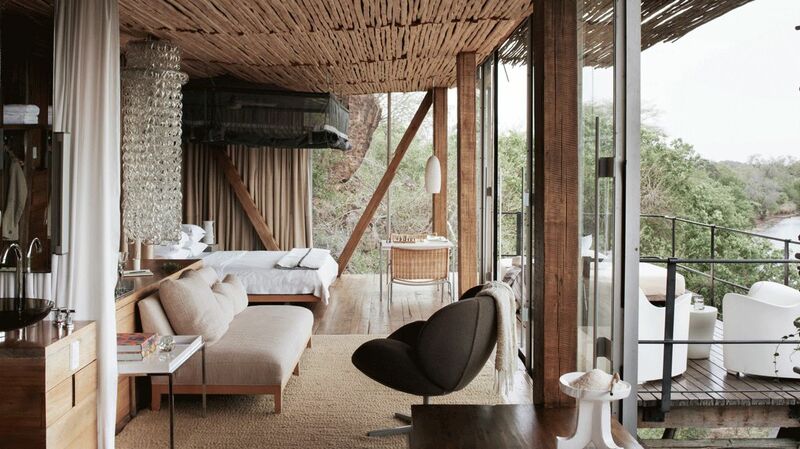 Built into the rocky hillside and seemingly suspended in air, the &Beyond Phinda Rock Lodge offers complete seclusion and privacy. The six romantic suites, clinging to the hillside and overlooking the idyllic Leopard Rock, are complete with a plunge infinity pool, rooftop dining, a roaring fireplace and an outdoor shower – making it the perfect sanctuary for a relaxing retreat. The &Beyond Phinda Private Game Reserve is well known for its up-close sightings of the ever-elusive cheetah and rare black rhino. Aside from these beauties, the reserve is also home to the Big Five, as well as 436 various bird species. The Phinda Private Game Reserve also resides near the unspoiled beaches of the Indian Ocean, where you can go on an underwater safari exploration and swim amongst some of Africa’s most exotic marine life. Get the best of both worlds – bush and beach – on this adventurous South African safari. If you are looking for the perfect South Africa safari holiday with the combined comforts of a luxurious stay, the Lion Sands River Lodge is your place. This luxury lodge is at the heart of Kruger National Park, with exclusive access to the wildlife-rich Lion Sands Game Reserve. Located on the banks of the Sabie River, the east-facing lodge offers glorious sunrises and reprieve from the midday heat, thanks to the 800-year old trees that surround the property. The 18 thatched villas, raised on wooden walkways, are all equipped with air conditioning, private plunge pool and an outdoor shower situated on a wooden deck from which you can survey the wild. The Lion Sands Game Reserve has one of the largest concentrations of wild animal species in the Southern Hemisphere. In addition to the Big Five, there are a number of other animals that are just as spectacular, such as the black-backed jackal, the impala and the chacma baboon, whose canines are longer than a male lion’s.